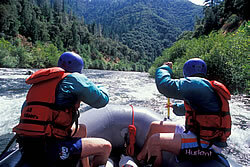 Welcome to American-Rivers.com, your American River rafting information resource. This site provides river flow and access information as well as general river descriptions essential to navigating the forks of the American River in California. This site is intended to help experienced California whitewater rafting enthusiasts organize an American River rafting trip. Anyone unfamiliar with American River rafting should consider planning a trip with a commerical whitewater rafting outfitter. The three forks of the American River begin in the peaks of the Sierra Nevada range in Northern California. From there they meander through granite canyons into the rolling foothills of the gold country. The three forks range in difficulty from Class II (beginner) to Class IV+ (advanced). The South Fork American is one of the most popular whitewater rafting rivers in the western United States. It jostles over friendly Class II-III rapids and meanders through the historic gold-mining town of Coloma. The Middle Fork American careens through a secluded canyon over numerous Class IV rapids, including infamous Tunnel Chute Rapid. The North Fork American relies on snowmelt for its flows rather than upstream dam releases-consequently, this American River rafting classic only runs in the spring. Looking for whitewater rafting information outside of California? Rafting.com: Whitewater Rafting Rivers and Outfitters provides information about whitewater rafting trips and outfitters throughout the United States and internationally.